Providing general and practical information and tips to help you get to know your new environment and solve your problems, covering basic necessities of life, e.g. how to find a flat; how to use public transport; where to get cheap and good quality of food etc. and cultural environment, e.g. what is the life of local people; how to make local friends etc. In so doing you are able to know your new physical and psychological environment in a most efficient way and be well prepared for your daily life in a foreign country. We will help you to identify the stress that you may encounter when you study abroad. By using psychological theory we will practice methods of releasing stress and improving time management. In so doing, you will be able to deal with stress and be more comfortable by yourself in future. This session aims to help you understand in advance all the difficulties you may encounter in your student life, including the different teaching methods; achieving a good result; reliving the pressure from studying etc. We will have invited guests to share their experiences about studying in the UK to help students truly achieve their goals and have a valuable experience while studying abroad. Dr.Zejun Yan has graduated from The University of Edinburgh in PhD Cell and Molecular Biology in 2013. He came to the UK from China when he was 16 years old and has lived and studied in Cambridge and Edinburgh for more than 10 years. Now he is working as a teaching assistant in the University of Edinburgh and at the same time preparing for his Postdoctoral work in his study area. 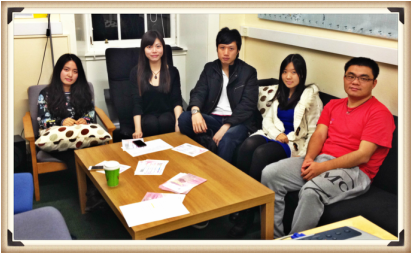 The experience of years of studying abroad have given him a clear and profound understanding about the education system in the UK and also generated a special view about the differences between studying in China and the UK, which will help us to explore how to study in the UK as a foreign student. By using psychological theory and methods we will help you to be aware of your self-consciousness and deal with problems such as low self-esteem and feeling shy when speaking in a foreign language. Studying abroad is not only for obtaining a diploma but also for self-growth and accumulated experience for the future. In this session we intend to help you further develop yourself; recognise the diversity of culture, language and lives between your home country and the UK. Ultimately you should learn to use the essential psychological theories and abilities to cross all the cultural barriers and difficulties when living abroad and enjoy your everyday life living in the UK; just like being at home.